Toby Jones Fishing: Brrrrrrr.... Happy New Year! It's deer season... and the fish ARE still here! It has been COLD lately... I wish I had a decent report for you, but I don't. As for me, fishing has been very slow. But I really do not have much to report as I haven't had a chance to get out in almost two weeks. When I did get out (a couple weeks ago), I fished for 2 or more hours on two consecutive evenings. 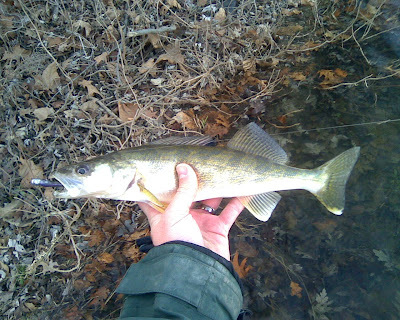 My grand total for the combined 4-5 hours of fishing time was 1 small walleye. Since then, I haven't been able to get out at all... Either the weather has been just too dang cold or the river conditions have not been fit when I have had the opportunity to go. I did talk to my Dad today, and received a positive report from him. He and my nephew Bailey hit the river for a few hours this afternoon. They didn't catch a lot, but my Dad did manage a couple quillback carp and a big sucker. 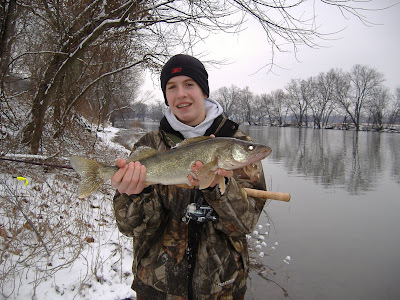 My nephew Bailey also scored a nice 22 inch walleye, which I think is his first walleye... not a bad way to start out! Dad emailed me a picture, so I'll post it for you. Bailey and my Dad also witnessed another gentleman land a small musky this afternoon. So, obviously, there are still some fish out there that are willing to bite. I'd say if you don't mind the cold and you get a chance to get out there and fish before things ice up, definitely go for it! Good luck, and maybe I'll see you on the water in 2010... Happy New Year!